on diversity at UW. The award will be ongoing and will be named the Judy Antell Diversity in STEM award. Judy is so deserving of this recognition; her legacy wi continue through the establishment of this award. 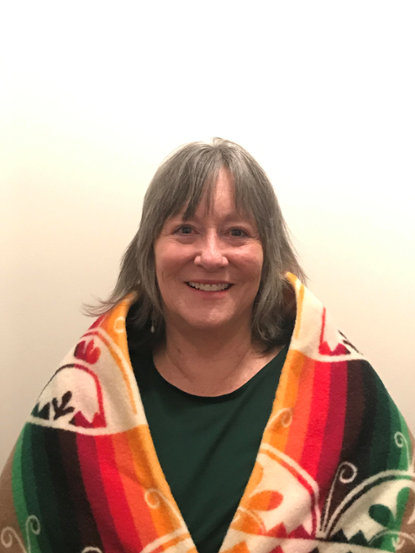 All of us on the HPAIRI team extend our heartfelt appreciation to President Nichols, to the UW Office of Research, to Wyoming EPSCoR, and to those who arranged the Own It! awards program. You have honored us with your support for HPAIRI and for Dr. Antell. 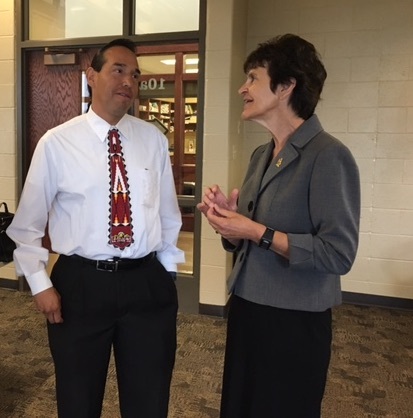 UW President Laurie Nichols speaks with Fort Washakie educator George Abeyta during her July 6 visit to the Wind River Indian Reservation. Nichols met with both the Northern Arapaho and Eastern Shoshone business councils, tribal liaisons, members of Wyoming Select Committee on Tribal Relations, and other invited community leaders while on the Reservation. Nichols' visit was organized and hosted by the High Plains American Indian Research Institute.